A map of our site is here. It shows all of the buildings and many of the locations where activities happen. You can download a printable copy (PDF) here. 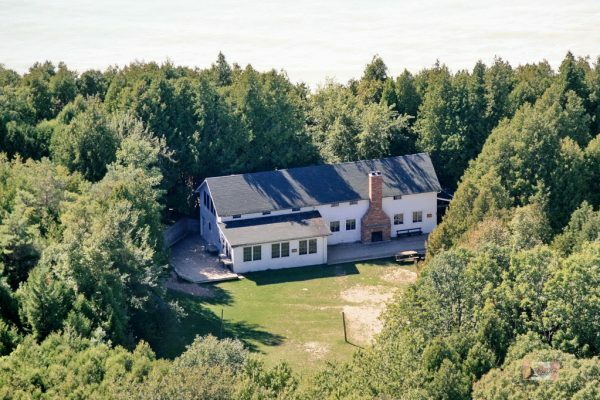 Click to view a 360° image of MacDonald Lodge. 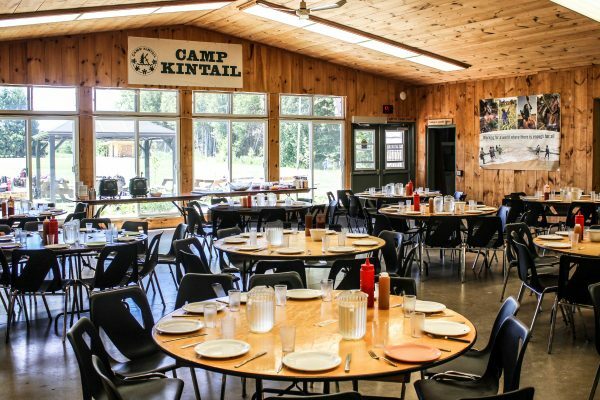 MacDonald Lodge is Camp Kintail’s largest building and is the first building you see when entering the site. It includes a large dining hall which can accommodate up to 200 people, as well as a large attached kitchen. 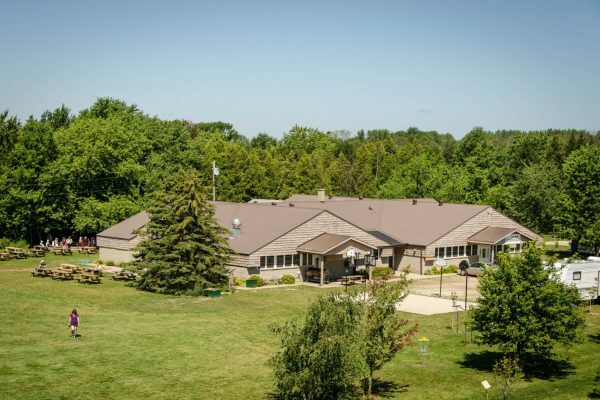 The Lodge kitchen includes a large hallway pantry, a walk-in refrigerator, a chest freezer, four gas ovens, an industrial coffee maker and a commercial dishwasher. 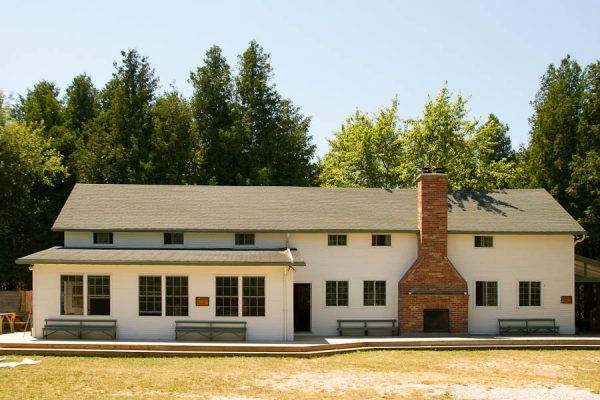 Behind the dining hall, MacDonald Lodge contains eight bedrooms, with room to sleep 3 – 5 people per room. Each room contains heat and windows for a comfortable sleep in any weather. There are two male and two female bathroom facilities in the building, which hold twelve toilets, two urinals and eighteen showers all together. 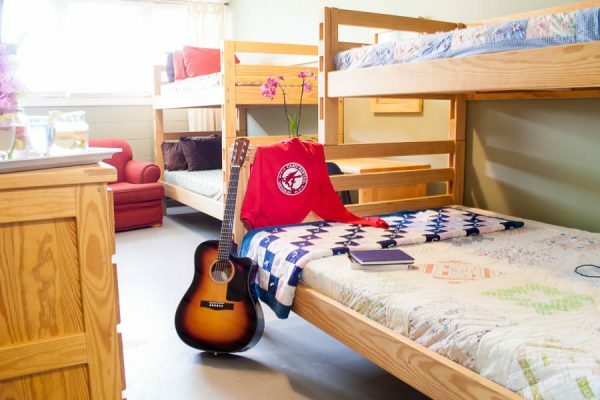 There are laundry facilities in MacDonald Lodge. A sound system is provided in the main dining hall. Finally, MacDonald Lodge contains a furnished meeting room for small groups. We have lots of hot water! Click here for a floor plan with dimensions of MacDonald Lodge. 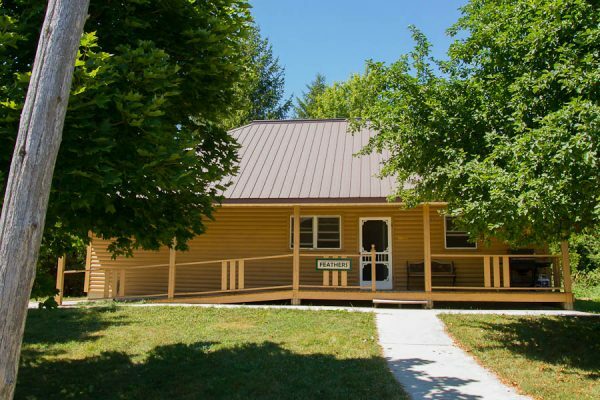 The Nest is a year-round fully accessible facility providing accommodations, meeting and program spaces, a dining facility and full kitchen. 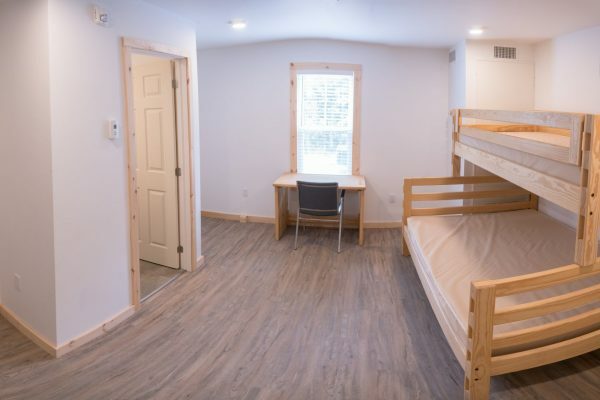 This building includes dorm style rooms which each sleep 10 on comfortable bunk-beds and have their own bathrooms with shower, and hotel-style private rooms with bathrooms that include a shower and bathtub. All accommodations have individual climate control systems for heating and cooling. There is a large hall for dining and large group meetings and activities as well as two smaller meeting and activity break-out spaces. 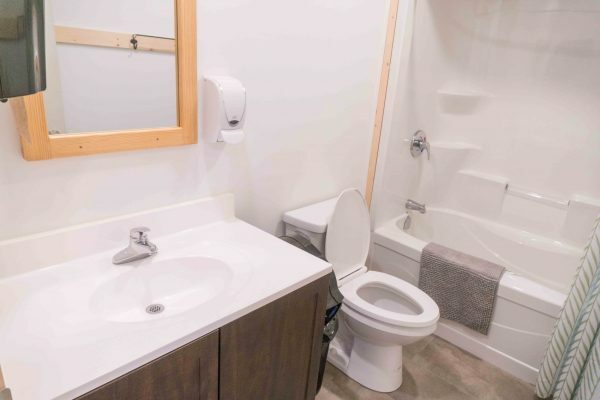 The building also houses general bathroom and shower facilities including a fully accessible washroom and shower space. Click here for a floor plan of The Nest. Click to view a 360° image of McKay Hall. Harmony House is the original Lodge that has been restored. The main hall of this building, called MacKay Hall, includes an indoor and outdoor fireplace, as well as space to seat 50 people in chairs comfortably. 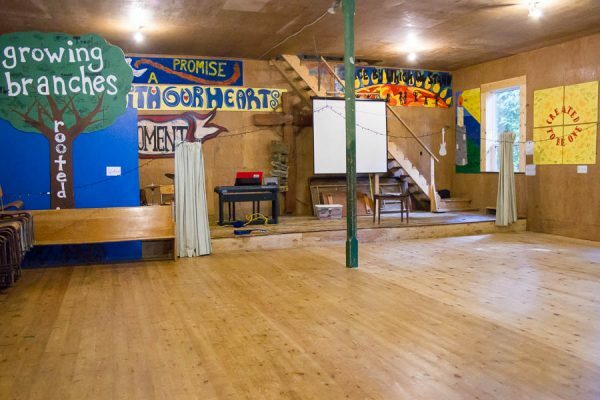 MacKay Hall is an ideal place for games, singing, meetings or small workshops. 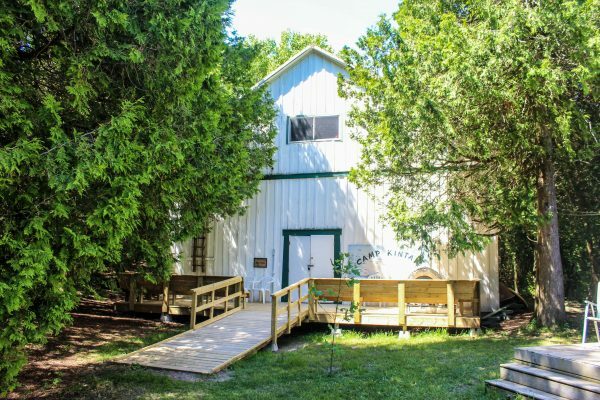 Bluevale deck is located on the back of this building facing the lake and can seat approx. 40 with a casual seating area with Muskoka chairs and a Chiminea, perfect for evening social time. The opposite half of Harmony House contains a brand new catering kitchen. The building includes two downstairs bathrooms. All of Harmony House contains hydro and hot water to ensure a comfortable stay. Click here for a floor plan of Harmony House. The Rec Hall is a large building with indoor space and seats up to 150. It has a wooden floor, new windows, low stage at the front, and is equipped with rectangular tables and chairs, a built-in sound system, keyboard and projector screen. 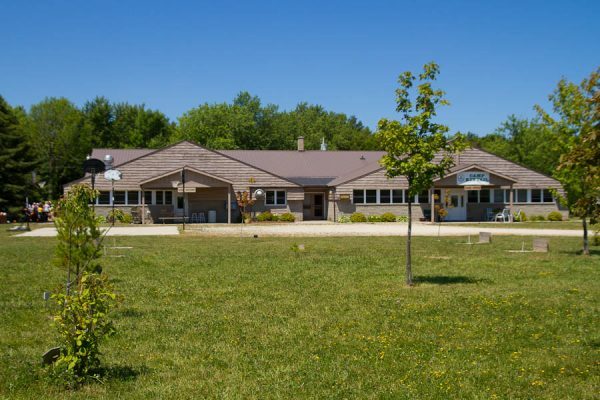 The Rec Hall is suitable for games, worship, indoor sports, meetings, or active workshops. It has a loft upstairs (only accessible by stairs) that can be used for small group discussions or activities. Click here for a floor plan of the Rec Hall. 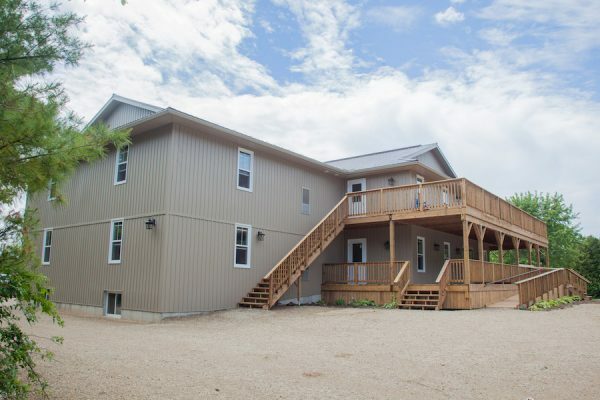 Feathers Cottage is a beautiful retreat cottage that is equipped with a household kitchen, 1.5 bathrooms, three bedrooms, and a comfortable living room with a pull out couch. 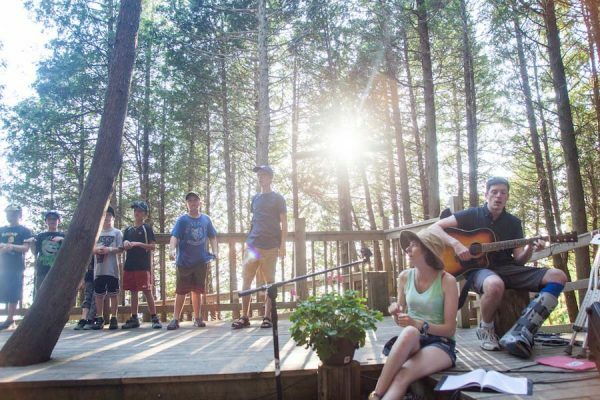 Feathers sleeps up to 8, has an oil furnace and central air conditioning, and is great for a small group retreat or a comfortable space for leaders or older members attending your retreat when using MacDonald Lodge or Harmony House. click here for a floor plan of feathers. Our spacious Cabins sleep 10 – 12 in bunk beds. 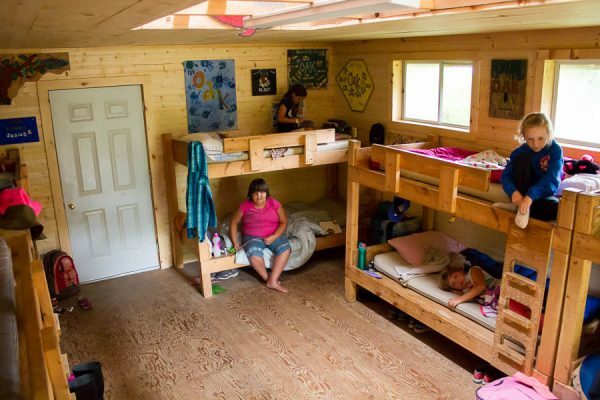 There are 20 cabins with electricity and heat that are insulated and are fully accessible. 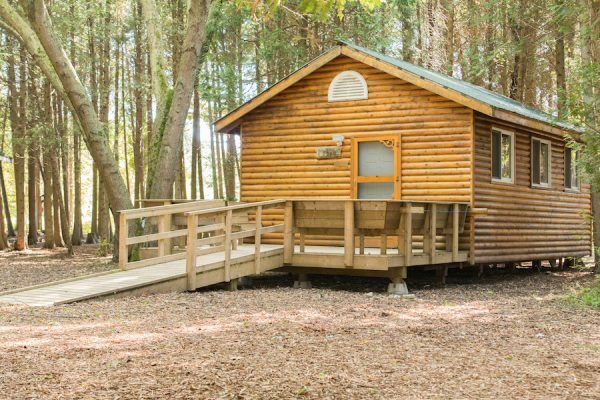 All cabins have front and back doors with decks, a picnic table, good vinyl covered mattresses on bunk beds, fire extinguishers and smoke detectors. Guests staying in cabins use the shared washroom facilities at cabin hill wash house, MacDonald Lodge or Harmony House. 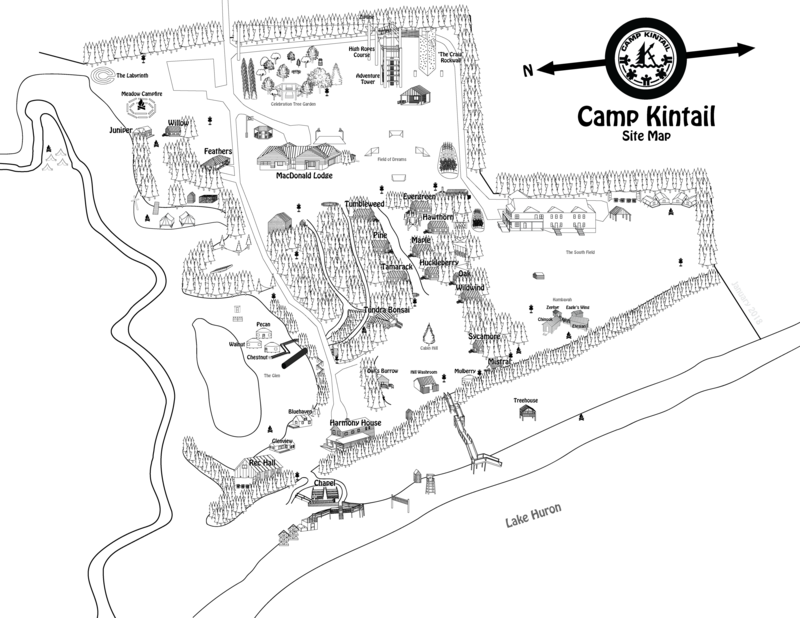 Click here for a floor plan of the Cabin Hill cabins. Traditionally a Yurt was a portable, round tent covered with skins or felt used as a dwelling by nomads in Central Asia. At Camp, the Yurts are structured by wooden poles and have reinforced walls with wooden lattice. They are kept dry from the outdoors by a canvas wall and ceiling, with a plexiglass dome at the peak. 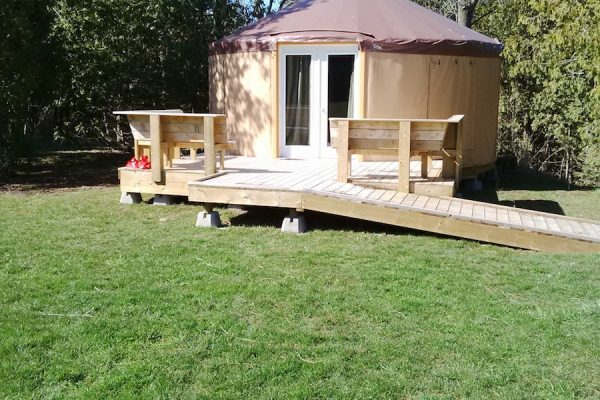 We have one Yurt (Mulberry) on Cabin Hill and 3 Yurts in “The Glen”. 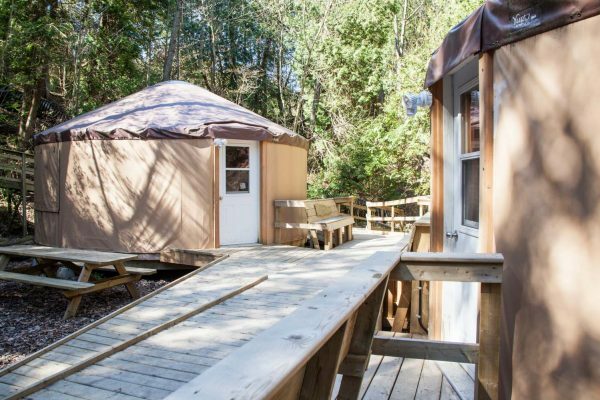 Each yurt has electrical outlets and a layer of insulation. 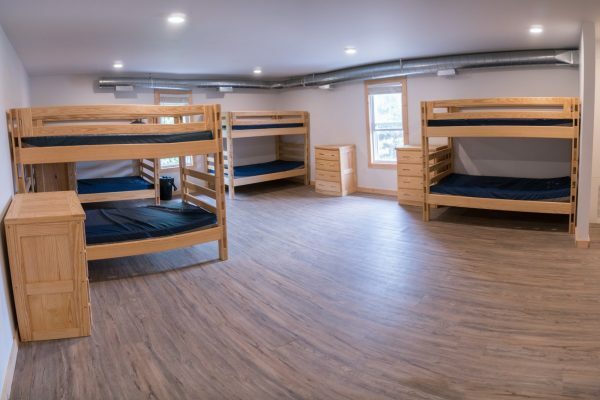 They can sleep up to 10 in each with 5 bunk beds. 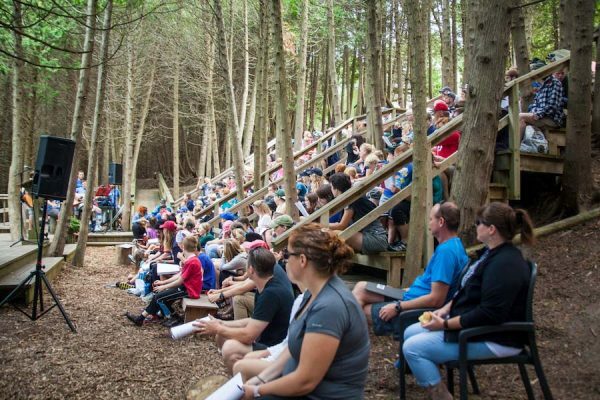 Our Outdoor Chapel overlooks Lake Huron and is situated in a cedar forest just steps from the Beach. Listen to the waves crash against the shore as you celebrate as a group in worship, workshop or presentation. Can seat up to 175 on tiered bench seating and a sound system is available to rent at a small charge. Click to view a 360° image of the Outdoor Chapel.